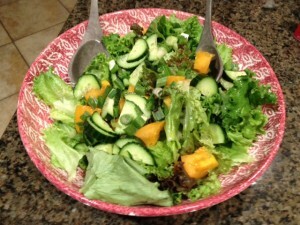 You are here: Home / Food / Dinner / Finally Found A Salad with Homemade Dressing & My Kids Love It! Manic: Trying to get my kids to eat more veggies, period! 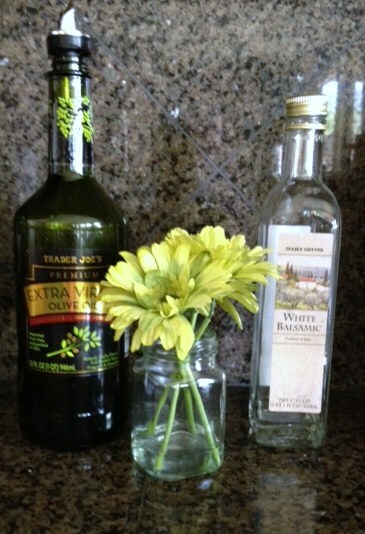 Managed: Finally found a homemade salad dressing and salad that my kids…and their friends….love! I attend a cooking class every Wednesday night, so this recipe is from my cooking instructor, Lyn McGuire. I’ll be blogging about my cooking class soon, too! Here is the salad recipe…. Lyn’s Lovely Salad that My Kids Love, Too! My salad is pictured with yellow tomatoes and they were quite flavorful! 1. Prepare your salad using lettuce, tomatoes, red onion, tomatoes and cucumber. 2. Pour equal parts of the olive oil and white balsamic vinaigrette over the salad. Depending on how big your salad is, you will determine how much. For my salad pictured above, I did 1/4 cup each. 3. Sprinkle with a dash of salt and pepper and serve. So delicious and nutritious! ***Lyn’s recipe did not call for cucumbers. I added those. What is your favorite homemade salad dressing? Share here in the comments section! This recipe looks delicious. I never thought about adding sea salt but I bet it tastes great. Thank you for sharing!